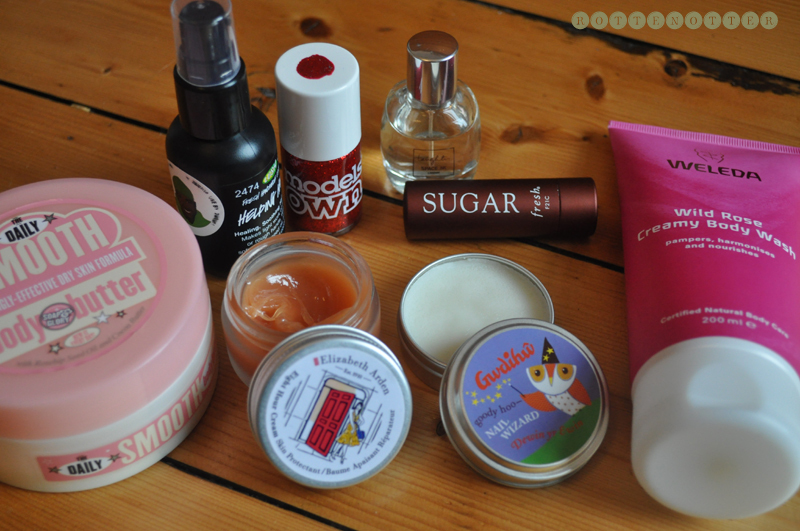 This months favourites is my little winter survival kit. It's full of products to keep you moisturised with a bit of festive fun. Soap & Glory Daily Smooth Body Butter - I've been using this on my feet every night to keep them smooth and soft. I walk around in my bare feet a lot in the summer so they're always really dry. This also smells great too. Lush Helping Hands hand cream - I've been keeping this in my bag as well as on my bedside table so I'm constantly applying this to my hands each day. I'm not so keen on the scent but it's really moisturising which makes up for it. It's lavender and chamomile scented but I think it's the chamomile that I don't like. I also love the little pump dispenser. Models Own Scarlet Sparkle - This is the perfect red glitter for this time of year. You can see my NOTD here. It's also pretty easy to remove for a glitter polish. Space NK Laughter Perfume - I got this mini bottle of perfume in my Latest In Beauty fragrance box and it actually retails for £25. I only bought the box for £5! It's a spicy citrus cologne scent which I love and works all year round. Fresh Brown Sugar Lip Treatment* - This is the only lip balm I've been using this month and it's worked wonders. You can read my full review here. Weleda Wild Rose Body Wash* - This is the perfect winter body as it's just so moisturising and it smells amazing. You can read my full review here. Gwdihw Nail Wizard* - Using this in conjunction with the Helping Hands hand cream has gotten my hands back into a good condition. Although my cuticles on my thumb and two fingers on my left hand haven't grown back. Not really sure what's up with that but it's been working wonders on my other cuticles. Love the scent too. Elizabeth Arden 8 Hour Cream Skin Protectant - I've been using this to combat dry patches of skin like on my elbows and knees. You can read my full review here.